A memorial celebration of the life and work of Professor M. Wayne Knight will be held on Saturday, Nov. 14 at 2 p.m. in HSU’s Reese Bullen Gallery. The gallery is located on campus in the Art Building directly across from the Van Duzer Theater. The public is invited to join family, friends, students and colleagues in remembering Professor Knight’s life and achievements. Knight died the morning of Oct. 21 at Mad River Hospital of complications brought on by H1N1 influenza. He had been hospitalized for a number of days. 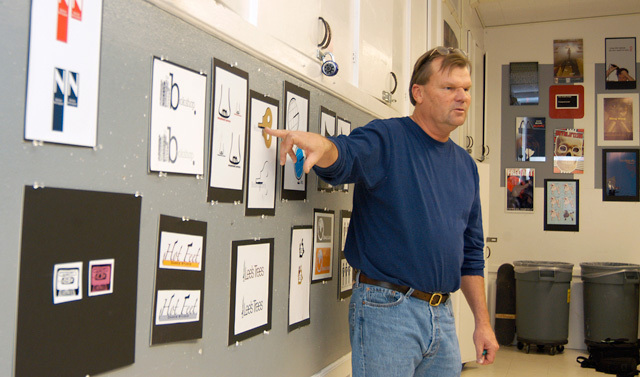 Knight joined the Humboldt State faculty in 2002 and taught graphic design, graphic design program development and graphics lab management. His exhibits spanned galleries from Rome to Los Angeles. His works also were featured on the Redwood Coast at HSU’s First Street Gallery and Reese Bullen Gallery, the Morris Graves Museum in Eureka, and the Grace Hudson Museum and Mendocino College in Ukiah, Calif., where his family resides. Knight earned his master of arts degree at San Francisco State University and his bachelor of arts at UCLA. From 1996 to 2002, he was art director and graphics specialist at SoftMed Systems, in Sacramento. A long-time freelance artist, he engaged in a broad variety of projects, including computer and traditional graphic design, portraiture, set design, murals, architectural rendering, video production and photography.